The Z Buzzz SS has been out for a while now (now being November 2011) and it has worked it’s way into quite a few bags. I picked up the tangerine colored version which was released as a CFR disc for the Memorial Tournament in 2011. It was the first major NT tournament in the year following Eric McCabe’s World Championship victory, and the disc has his silhouette on it. When I first saw the Discraft description, I honed in on the phrase “WELL SEASONED BUZZZ” and assumed it meant ‘flippier.’ I expected to throw it on upshots like I did with my regular Buzzz and assumed this would have an easy right turn for me. This wasn’t the case for my first Buzzz SS. The tangerine colored one has yet to flip for me actually. The lack of understability turned me off from it for a short time, and then I read an interview with Eric McCabe in which he described it as a “longer Buzzz-” even saying that he could throw it almost 400ft? This helped give me the confidence to use the Buzzz SS as my first “midrange as a driver.” Being a newer player, I had never stepped up to a teebox and grabbed anything except a driver. In any case, this mini-breakthrough for me as a player helped me learn the natural flight of the Buzzz SS. However, my next Buzzz SS was much more understable. I don’t know what the exact cause is, but my first/original tangerine colored disc is more stable and I can even use it in windy situations as well as just straight 200 to 280 foot drives when I count on it to not flip over. In general, after purchasing a few different versions and stamps of the Z Buzzz SS, I would agree that it IS a ‘well seasoned buzzz’ but I would add the disclaimer that it flies further and seems faster. It has a ton of glide and the rim is very comfortable. Discs like the ‘Hornet’ and ‘Wasp’ have a much harsher rim edge that requires a pretty accurate grip/release, and this Buzzz SS avoids that pitfall. The rim is really a personal preference issue, but in my case I strongly prefer discs with this solid rim shape. The natural tendency of the SS to be flippy (on average) makes it capable of a very versatile flight path. You don’t need to spend a month throwing it before getting the chance to throw legit hyzer-flip shots. In fact, if you get a small stack of these, it’s a great practice disc for field throwing and learning the nuance of a good hyzer-flip. On this note, the Buzzz SS is also a great disc for anhyzers- and will aid in players being more accurate, but doesn’t necessarily take away much distance compared to a fairway driver like the Leopard (throwing anhyzers). If you haven’t thrown one yet, I definitely recommend it. This disc performs well beyond a typical mid-range and isn’t just some specialty disc. 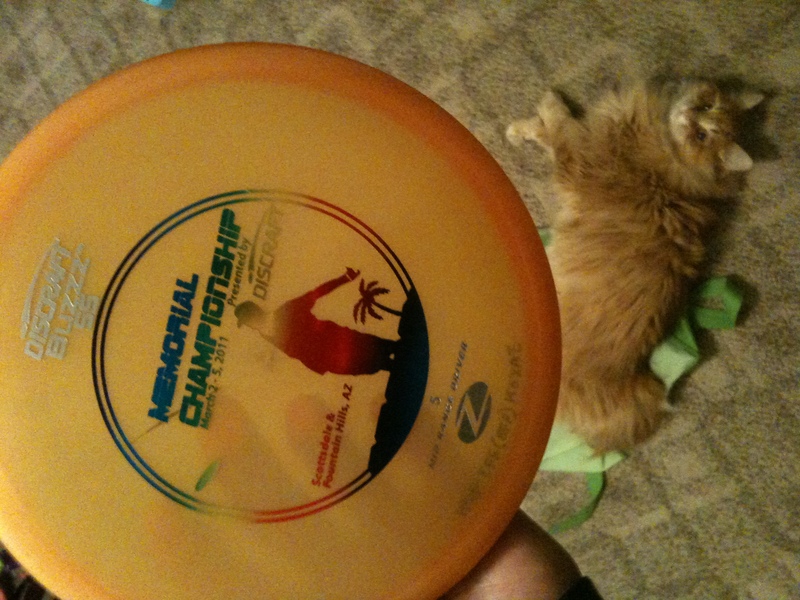 In heavily wooded courses, if you master this disc, you will be a dangerous player… in my opinion. Rock on dudes, buckle up. Be young, have fun, and keep up the stuff. Always believe. Never forget. No retreat, no surrender. This entry was posted in Equipment and Gear and tagged 2011, buzzz, disc, discraft, golf, memorial, review, ss, z. Bookmark the permalink.